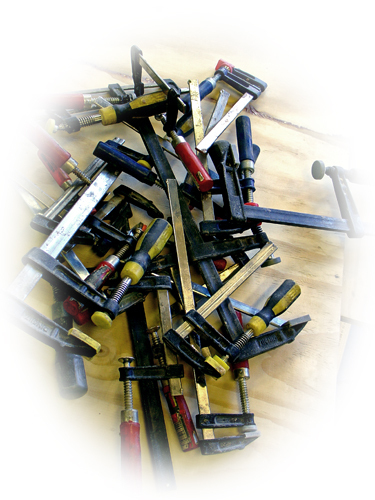 Clamps, you can’t have too many. We started out with around ten of them. Now we have over thirty. Very important note here – get the cheapest. Epoxy ruins the good ones very fast, because it gets between the fine cast parts and jams the clamp up. Cheap ones have a lot of play and are not afraid of epoxy. Cheap clamps are not expensive. They do break though, I mean the cheap ones. Get various sizes as well, some long ones, wide ones, short ones. They are all good. Get ready to clamp up!